This report is designed to give you the information you need for customers to claim tax rebates for health and fitness expenses! It reports the payments made by year with a total separated out by Tuition, Camp, Anniversary and Other fees. It can be generated in HTML, PDF, XLS or CSV for easy saving and printing. To begin, go to Reports > Financial > Family Annual Total Receipts Report (FIN-15). 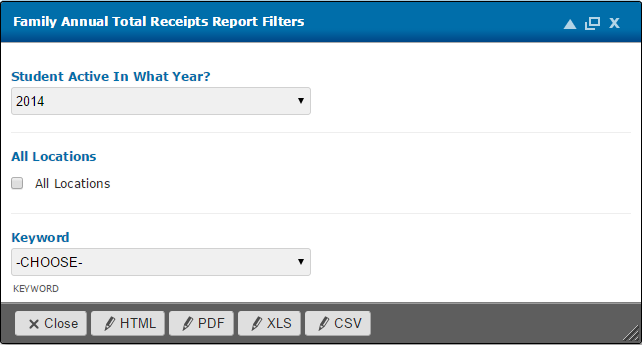 Select the year to report payments from under Student Active in What Year? Choose All Locations if you have a multi-location account and would like to see payments from all locations. (Optional) Select a Keyword if the report is being generated for only specific families with that Keyword applied.